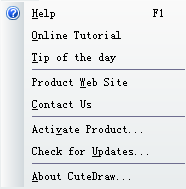 New: Creates a new Edraw document. Close: Closes the active document. Save as: Saves the document under a new name. Import: Import the common graphic format into Edraw, Include, bmp, jpeg, png, gif, tif, wmf, emf and PhotoShop format. 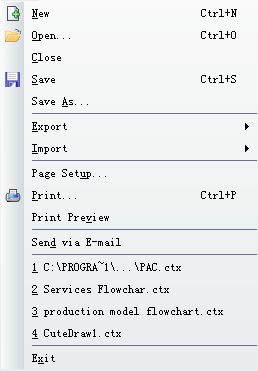 Page Setup: Allows to set the printer page parameters in the Page Setup dialog. Print preview: Allows to preview the results before printing. Send via E-mail: Sends a document by e-mail. Open Recent: Displays a list of the most recently opened documents. When you choose a document from the list, the program will open it unless it was deleted or renamed. Undo: Cancels the most recent action. Redo: Cancels the last Undo operation. Cut: Cuts selected text or shapes and copies them onto the Clipboard. 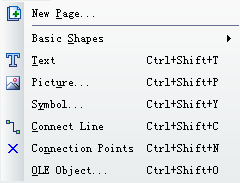 Copy: Copies selected shapes or text onto the Clipboard. Paste: Inserts the contents of the Clipboard into the document. Delete Page: Delete current active page. Select All: Selects all shapes in the document. Link: Open Ole link and edit with the object contain. Library Window: This menu is used to display, hide and change the appearance of the library window. You can open all shapes in the library window. 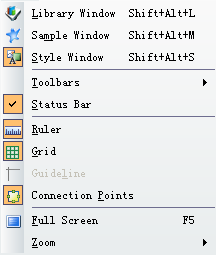 Sample Window: The window includes lots of examples. Style Window: The window includes some pre-defined color scheme, style. You can modify the shapes by modifying the style in use by the window. Connection Point: Shows/hides the connection points of shapes. Full Screen: Shows the drawing document in full screen. Zoom: Lets you choose various zoom settings. Sets the specified zoom level for the active document window. New Page: Add a new page in the current document. Basic Draw Shape: Insert basic draw shape, such as rectangle, ellipse, line, arc ,curve, curve and freehand. Text:Activates the Edit Text tool mode which lets you edit the text of the shape, and also create new "Text" shapes. Picture: Inserts a picture into the document. Symbol: Inserts a symbol into the document. Connect Line: Activates the Smart Connector tool mode and lets you draw smart connectors. Connection Points: Activates the Direct Connector tool mode and lets you modify the property of connection points. OLE Object: Inserts ole object. Text: Calls the Text Properties dialog for formatting text. Line: Call the Line Properties dialog for formatting line. 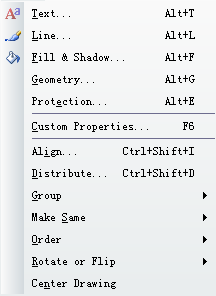 Fill & Shadow: Call the fill and shadow properties dialog for formatting shapes. Geometry: Set the width, height, aspect, position accurately. Protection: Lock or unlock the properties of shapes. Include width, height, aspect ratio, x position, y position, rotate, text, edit vetex, from selection and from delete. Custom Properties: Set the custom properties for the selected shapes. Align: Align the selected shapes, include Left Align, Horizontal Center Align, Right align, Top Align, Vertical Middle Align and Bottom Align. Distribute: Distribute selected shapes. Include 8 distribution method. Make Same: Make the selected shapes with same width, same height, or same angle. Order: Adjust the shapes order. Rotate or Flip: Rotate or flip the selected shapes. Center Drawing: let all shapes center align relative to page. Select: Activates the Select tool mode. Grid & Ruler: Set the grid and ruler. Snap & Glue: Set the snap types. Customize: customize the user interface. Options: Configure the program properties. New Window: New a document. Cascade: Arrange windows so they overlap. Tile: Arrange windows as non-overlapping tiles. Online Tutorial: Review the online video tutorial. Product Web Site: Visit product web site. Contact Us: Contact us and send your feedback. Activate Product:Convert your copy into the full version. Check for Update: Online live update. About Edraw: Display program information, version number and copyright. This menu shows when you right-click on a Folder in the library window. New Template: new a template. Load Template: Load an exist template. Basic Shapes: Some common templates. 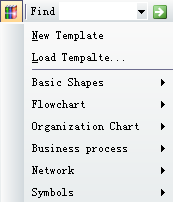 Business process: Some business templates. This menu appears when you right-click on a shape in the library window. 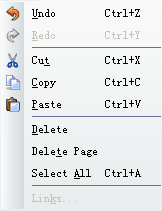 Cut: Cuts the selected library shape and copies it onto the Clipboard. Copy: Copies the library shape onto the Clipboard. Paste: Pastes the shape from the Clipboard into the library. Delete Shape: Delete current selected shape from the library. Add Item: Add the shape to the current library. 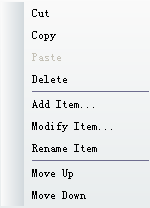 Modify Item: Modify the selected shape in the library, include name, tooltip, icon and content. Rename Item: Rename the shape item in the library. Move Up: Move up the selected shape. Move Down: Move down the selected shape.